Elvis Aaron Presley (Tupelo, Mississippi, January 8, 1935 - Memphis, Tennessee, August 16, 1977), was an American singer, song producer and actor. 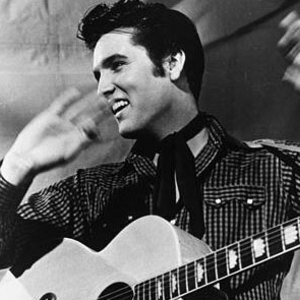 A cultural icon, he is widely known by the single name Elvis. Elvis Presley began his music career at Sun Records in the spring of 1954 when Sam Philips recorded Elvis performing several of Elvis' favourite songs with Scotty Moore (guitar) and Bill Black (bass). One of these covers was a country and western song, "Blue Moon of Kentucky". Elvis Presley began his music career at Sun Records in the spring of 1954 when Sam Philips recorded Elvis performing several of Elvis' favourite songs with Scotty Moore (guitar) and Bill Black (bass). One of these covers was a country and western song, "Blue Moon of Kentucky". Elvis is the best-selling solo artist of all time in the United States with confirmed 189.2 million records in RIAA shipments. Before Sam Philips sold Elvis' contract to rca victor in 1956 for $35,000 they had recorded six two-sided singles. Each of these recordings featured a country and western song on one side and a rhythm and blues song on the other. One of the reasons Elvis was so popular was because of his ability to merge attributes of what was perceived to be "white" (C&W) and "black" (R&B) music. An example of this is evident in Elvis' hit song "Heartbreak Hotel" which reached #1 not only in the pop charts, but the R&B and C&W charts as well. This was the first time that a single song held the #1 spot in all three charts. Elvis remains a popular and enigmatic star. His legend has only grown stronger since his death. In fact, there is a widespread belief that Elvis?who was known by his first name?did not die in 1977. Many fans persist in claiming he is still alive, that he went into hiding for various reasons. This claim is allegedly backed up by thousands of so-called Elvis sightings that have occurred in the years since his death, and by the fact that his middle name Aron was misspelled Aaron, with two As, on his tombstone. During an active recording career that spanned more than two decades, Presley set and broke many records for both concert attendance and sales. Some of those records have since been matched and/or broken by other artists, but some of his records will probably remain unbroken and/or unmatched forever. He has had more than 120 singles in the US top 40, across various musical genres, with over 20 reaching number one. Elvis Aaron (sometimes spelled Aron) Presley, in the humblest of circumstances, was born to Vernon and Gladys Presley in a two-room house in Tupelo, Mississippi on January 8, 1935. His twin brother, Jessie Garon, was stillborn, leaving Elvis to grow up as an only child. He and his parents moved to Memphis, Tennessee in 1948, and Elvis graduated from Humes High School there in 1953. Biography: Elvis' musical influences were the pop and country music of the time, the gospel music he heard in church and at the all-night gospel sings he frequently attended, and the black R&B he absorbed on historic Beale Street as a Memphis teenager. In 1954, he began his singing career with the legendary Sun Records label in Memphis. In late 1955, his recording contract was sold to rca victor. By 1956, he was an international sensation. With a sound and style that uniquely combined his diverse musical influences and blurred and challenged the social and racial barriers of the time, he ushered in a whole new era of American music and popular culture. His talent, good looks, sensuality, charisma, and good humor endeared him to millions, as did the humility and human kindness he demonstrated throughout his life. Known the world over by his first name, he is regarded as one of the most important figures of twentieth century popular culture. Health problems, drug dependency and other factors are said to have led to his premature death at age 42 at his Memphis home, Graceland, on August 16, 1977.